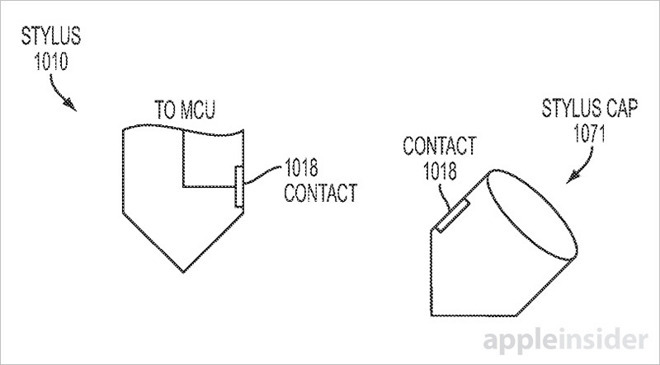 A years-old Apple patent filing might yield clues as to the company's future plans for Apple Pencil, as the document includes never before seen features like interchangeable multifunction nibs with built-in sensors. 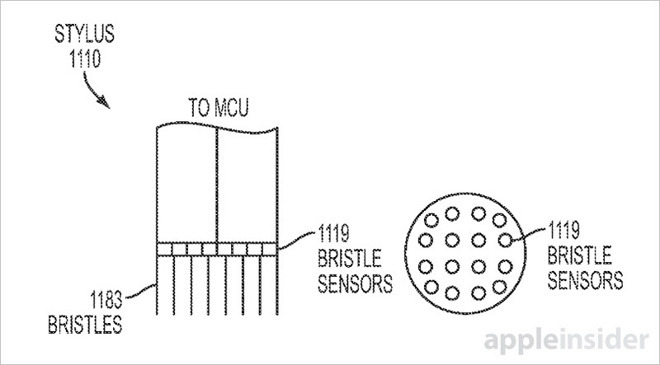 Like Apple Pencil, the device described by Apple's U.S. Patent No. 9,329,703 for an "Intelligent Stylus," as awarded by the U.S. Patent and Trademark Office on Tuesday, employs sensors, microprocessors and advanced algorithms to capture hand gestures for display on a digital touchscreen. Both Pencil and the proposed device operate by determining stylus condition at a set point in time, specifically when the conductive nib makes contact with a tablet's capacitive display. These conditions are measured by a set of onboard sensors ranging in capability from pressure sensing to proximity awareness, broken into readable data and sent to a host device via suitable wireless communications protocol. Pencil, for example, boasts a finely tuned pressure sensor capable of determining fine changes in input force, usually resulting in variably thick or thin lines onscreen. Further, two emitters embedded in Pencil's tubular chassis send out signals detected by iPad Pro to determine tilt, a metric that again changes onscreen output. The invention detailed today supports stylus conditions identical to those built into Pencil, peppering in a few more hardware options like hot-swappable active nibs and additional sensing equipment. In some embodiments the replaceable tips carry unique identification codes readable by specialized sensors embedded within the stylus body. 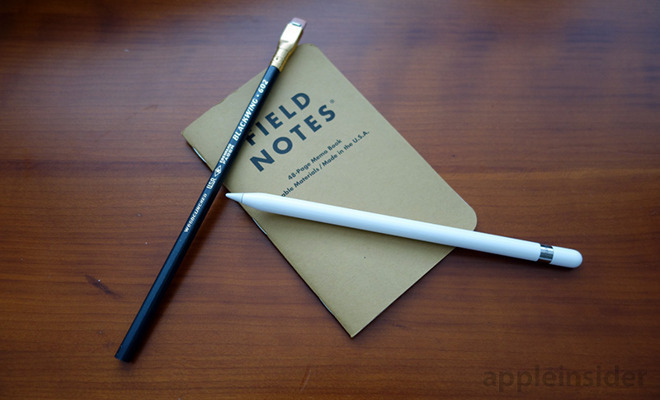 Each tip type —brush, pencil, felt tip pen and others —supports a different stylus condition. For example, a brush tip might cause the onboard microprocessor, or alternatively a host iPad, to interpret long painterly strokes in a completely different manner than a pencil tip. Likewise, users would be compelled to manipulate the stylus as they would a real writing implement or drawing tool. 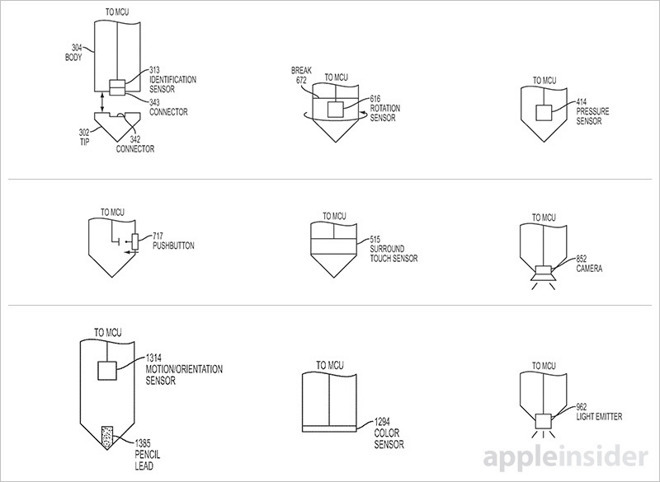 Apple proposes a number of nib attachments as potential candidates for integration, including exotic examples like a force-sensing bristle brush, motion-tracking camera and a flashlight. An alternative design incorporates an actual lead tip that translates pencil-on-paper stylus motion into digital handwriting, much like product offerings from companies like Livescribe. The invention extends hardware identification beyond replaceable nibs. In some embodiments, individual owners or devices might also sport unique codes, a useful feature for collaborating on a single iPad. Fingerprint recognition is mentioned as a potential means of authentication, a function that also serves as an effective security measure. If a user's fingerprint is not recognized, the stylus would deny input, for example. In addition to the usual nib sensor, the document suggests embedding a second, sister sensor into the non-tip end, proving Apple at least contemplated the inclusion of an "eraser" for Apple Pencil prior to launch. The document goes on to discuss alternative embodiments including a multifunction push button and sensors capable of measuring rotational movement. As Apple Pencil hit store shelves mere months ago, and with supply only now catching up with demand, a second-generation version is unlikely to appear anytime soon. Apple's intelligent stylus patent was first filed for in 2011 and credits David R. Falkenburg, David I. Simon, Jonah A. Harley, Andrea Mucignat, Brian Richards Land, Christopher Tenzin Mullens and Steven Porter Hotelling as its inventors.